This library is for displaying dialog boxes and constructing basic GUI’s. The library is intended to be simple and quick to use. This library requires Early Access Mode. You can make a “mode-less” (not modal) dialog with modal=false. This means it doesn’t wait until the dialog closes but returns immediately and allows other windows to still be used. A modeless dialog immediately returns the window object w, which has a method w:update that can be used to update the window. Passing no arguments causes the update function (if any) to be invoked; alternately, you can pass it a different update function, as shown above. The dialog function has this interface. controls... is a comma separated list of controls to display in the dialog. The controls are displayed in the order given. See “Control Types” below. modal is whether to display as a modal (true) or mode-less (false) dialog. The default is true. A modal dialog does blocks (does not return) until the user closes the dialog. 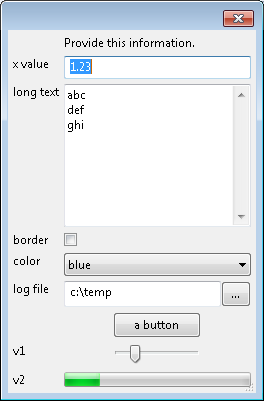 A mode-less dialog returns immediately and allows other windows still to be used. 'create' - called when dialog is first created. 'close' - called when dialog is being closed or requested to close. event.id will contain the ID of the button used to close the dialog (or Cancel if closing without a button such as by pressing the ESC key or X in the title bar). If update returns false when a button that is not a cancel button is pressed, then the dialog will not be closed. 'change' - a value in a control has changed. event.id will contain the ID of the control that has changed. 'update' - caused by a call to window:update . e.id is the name of the control that caused the event or nil for event types like 'update' that are not associated with any specific to a control. Example: update=function(data,e) data.title = e.type..' '..tostring(e.id) end. buttons is a string containing a list of button labels separated by the | character. These display at the bottom of the dialog. The first button is understood as an OK button. The last button (if more than one button) is understood as a Cancel button (and responds to the ESC key). Example: '&Yes|&NO|&Cancel'. If value is a string or number, then type will be text. If value is a boolean, then type will be checkbox. If value is omitted (nil), then type will be static and label will be used as the value. label is a string that will be displayed before the control. It will also serve as the identifier id if id is not specified. id is a string that identifies the control in the code. If omitted nil, it defaults to the label given (but stripping out any ‘&’ characters). id will be the key in the data table (returned by simion.experimental.dialog or passed to an update function) to access the corresponding value (data[id]). value is the initial value for the control. It defaults to nil. The data type of value is also recorded, and if it is a number or boolean, then any new value written to the data table will be represented in the same type if it is possible to do so; otherwise, the data table will contain a string value. help is a string of help text (almost like a tooltip) displayed when the focus is on the control. It defaults to nil for no help. This creates a static text control. It is used for displaying a string that the user cannot change. label is a string to display. This creates a text box control. 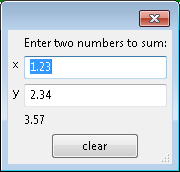 It is used for entering a string (single or multi-line) or number. value is string, number, boolean, or nil. multiline determines (true/false) whether this is a multline text box or not (default false). A multiline text box allows new linse to be included and usually contains multiline lines. This creates a check box. It is used for entering a boolean value (true/false). value is a boolean (true/false). It defaults to false. This creates a choice box, for selecting a value from a drop down list. values is a list of values in the choice box, and value should be one of the values (defaults to the first value if omitted). value will be nil if no item is selected. This creates a button that can be clicked. If the label contains a “&” then the character proceeding it is an accelerator key (e.g. “&Cancel”). This creates a slider control, which is like a scroll bar to select a value. The value ranges between 0.0 and 1.0, will be truncated if outside this range, and defaults to 0.0 if nil. This creates a progress bar. It can be useful for displaying the percent complete for some operation. The value ranges between 0.0 and 1.0, will be truncated if outside this range, and defaults to 0.0 if nil. An update function may call simion.sleep(), and if a request is made to close the window during the sleep, that request is ignored. This prevents the window being destroyed when an event handler is currently being processed. Currently there is no way to add/remove controls after the dialog is created. Perhaps this is not commonly needed. The layout is currently limited to placing the controls in a vertical list with labels, like a property sheet. Possibly add other control types. SIMION Example: gui - examples of using this library. 8.2EA-2017-01-30: Reuse same table for simion.experimental.dialog return value and update function. Useful for modal=true so that return table updates as GUI is changed. 8.2EA-2013-04-30: Allow changing choice control values during update. Add wildcard to file control. Allow label on static text.